It is hard to believe it was almost a year ago (2/27 to be exact) that Maryland toppled Virginia Tech one of the more memorable games I can recall as a Terps fan. The tip time was originally scheduled for 4:00 pm, but a beer truck ran over a nearby fire hydrant hours before the game, fracturing a water line that led to the Cassell Coliseum in Blacksburg. The game was delayed nearly three hours, but once it got going, it was ACC basketball at its finest. It featured 24 lead changes, 15 ties, and two overtimes. Greivis Vasquez dropped 41 and Malcolm Delaney added 28. When all was said and done, Maryland came out on top with a 104-100 win, and a NCAA Tournament berth was all but secured. Fast forward to tonight’s game where the Terrapins (16-9, 5-5) need a win much more than they did last year when they visited Tech. But the Hokies (16-7, 6-4), even with seniors Delaney and Jeff Allen, are not where they would like to be record-wise at this point in the season. They need this game just as bad as the Terps do if they want to make a run at the big dance, especially after getting snubbed by the selection committee a year ago. Delaney has been a fantastic player in his four years as a Hokie, however, it has been Allen that has carried the load in the last few weeks. In the past five games, he hasn’t scored less than 15 points or grabbed fewer than 11 rebounds a single time. Over that span, he’s averaging 20.2 ppg and 13.2 rpg. Maryland’s Jordan Williams has similar numbers for the season in 17.1 ppg and 11.8 rpg. It will be interesting to watch these two go at it and fight for boards. Allen has the edge at the foul line (66%) shooting a full ten percentage points higher than Williams (56%). Back on January 20 of this season, the Hokies came into College Park and dealt the Maryland their worst loss ever in the Comcast Center, a 17 point defeat. You know that game is still fresh in the minds of players from both teams. Across the board, Tech is the more talented team. 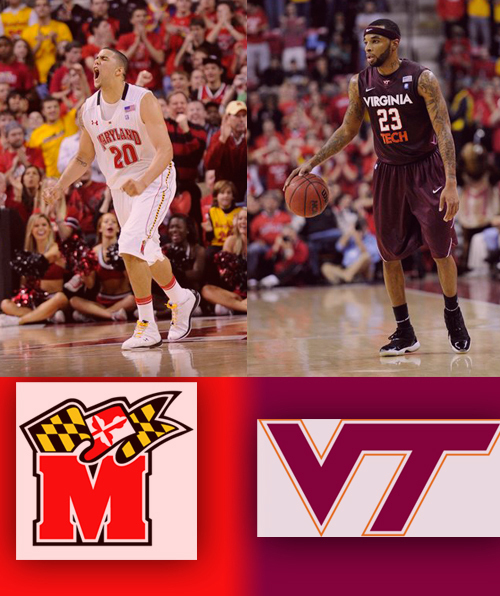 But if the Terps can play a complete game tonight, I really believe they can pull this off. –Sean Mosely finally stepping up. 7.7 ppg in ACC games this year?? He has more than that in him. He knows this offense and can attack the rim well. I don’t see any reason why he can’t finish with 15 tonight. –Hitting free throws. UMD is shooting 65.2% as a team…tied for 281st in the country. It has been said since those 2K Sports Classic games back in November against Pittsburgh and Illinois, the foul shooting have to improve. –Cutting down on Turnovers. One stat that was critical to Maryland’s win in last year’s thriller against Tech was the turnovers, or lack thereof. In the entire second half (including both OT’s), they only committed two turnovers. Two! Possessions are so valuable, throwing them away with careless passes, charges, and moving screens cannot happen tonight if the Terps want to win. 13.6 is their season average. Keeping that number below double digits will would help immensely tonight.